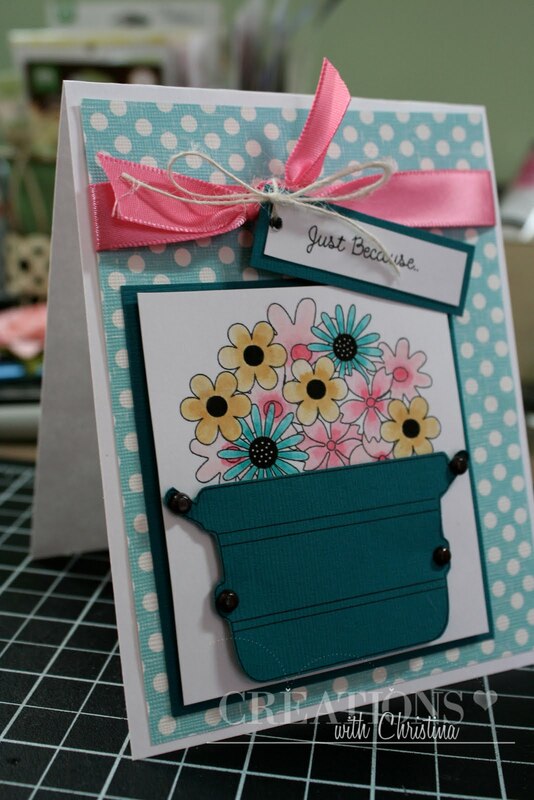 Today's card features the Beautiful Blooms digital stamp set from The Cutting Cafe'. I'm really enjoying working with these digital stamps. They are so easy to use. Just print them out on Cardstock and your done! Ready to create....Super easy and fun! Supplies: Daisy Bucket pattern paper, Bazzil cardstock, Georgia Pacific cardstock, Hibiscus Burst satin ribbon-Paper Trey Ink, Twine-Paper Trey Ink, Brads, Blender pen-Stampin Up!, Stampin Up! ink. I hope you all have a great day. I finished another mini this week, so I'll be back with a video of my completed mini sometime this weekend. Love your blog, your cards and your videos. I also like your new blog design. I just grabbed your button too. You are doing great cards. I have many digi stamps and forget to use them! Do you catalog yours a certain way on your computer? Beautiful card, i love digital stamps. I love digi stamps! Your card is lovely as always. Such a talent to be able to put things together the way you do. A video on how to print and size the digis might be really helpful to those still on the fence about whether to buy and use them. love this card. I may have to try going digi. Thank you for sharing. I enjoyed the video. I have purchased one digital stamp, but I am just not sure how to use it. Do you just use regular printer ink or photo ink or something special? I love the possibilities but am having trouble finding details! I've always wanted to try Digital Stamping. After watching this video, I'm tempted to try today. Thanks for sharing with us! Beautiful card. I have been looking at The Cutting Cafe digital stamps and after seeing you use them, I will probably give them a try. Love the card! The other thing about the digi stamps is not ink on your fingers. LOL Gota love that. Beautiful card. I love the look of your blog. Did you have a web designer do it? You make it seem so easy! The card is perfect for Mother's Day! This is such a beautiful card! I love the colors! Love this card Christina! So pretty! Really love this card - may have to look into this 'digital' thing!! Love how you made this card. Really cute! Thank you for the digital video. More please. I've never done it beofore. I subscribe to the Cutting Cafe but haven't bought anything yet because I didn't know what to do. Beautiful! I am a little daunted by digital stamps. I don't cut out tiny details very well. You did such a wonderful job! Pretty card - I love the colors! Hey Christina, when I looked at the flower stamp again this morning, I discovered that the top flower looks like bunny ears!!! It would be perfect for Easter! It's a shame it's already passed by. Very cute! Beautiful card! I will be trying the Cutting Cafe this upcoming month. Great card, love the digital stamping concept! Your videos are always so wonderful - thanks for sharing. love the card, and thanks for tip on using digital stamps! that is a great selection.